Shopmate is a shopping list organizer focused on simplicity and usability, ideal for frequent shoppers with no interest in complicated tools. Visit us at http://www.doublewedge.com for more information and screenshots. Over forty 5-star reviews from satisfied customers! Based on a simple, intuitive interface and a selected set of powerful features, Shopmate will assist you in organizing all your shopping trips, customizing your ideal product catalog and understanding your shopping patterns. 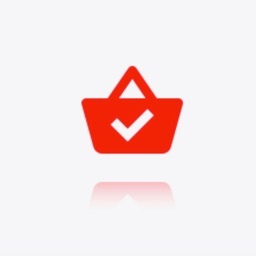 * An incredibly simple (yet powerful) shopping list manager. * Intuitive controls, elegant design (lots of love). * A fully customizable product catalog. * Share shopping lists via Mail or SMS with family and friends. * Statistics and insight on your shopping patterns. -"This really is the ultimate shopping app. It does everything I need and much more." -"This is the best, most useful app on my devices! Easy to use for making the lists and while shopping. My lists are now more complete and I am not forgetting to get things I have to go back for. Fantastic!!" -"Outstanding! 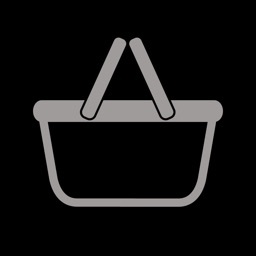 By far the best shopping program I've ever seen or used." -"This is great! You can have multiple stores and lists. It looks clean, well organized and easy to use! I'm so happy I found it. I've tried other apps and this is by far the best!" 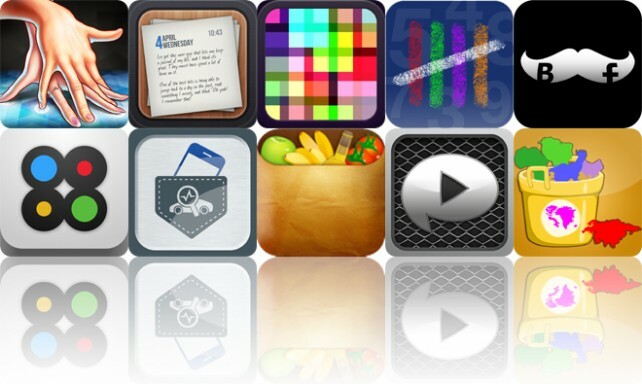 -"I love your app Shopmate, it's very useful when I go to supermarket and shops! :)"
-"Super simple and practical. Love it with each update." -"Thanks for the best shopping app." -"I really like this app, I see some innovative features." -"It is quite straightforward to use while having enough features to make it useful." 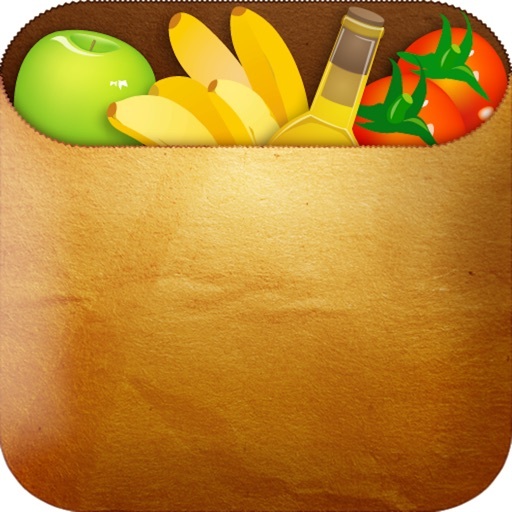 -"Very good shopping list manager, super simple and useful." 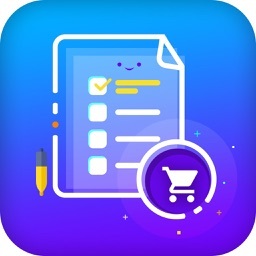 - Create a shopping list each time you need to go shopping. Keep them as history, don't delete them! 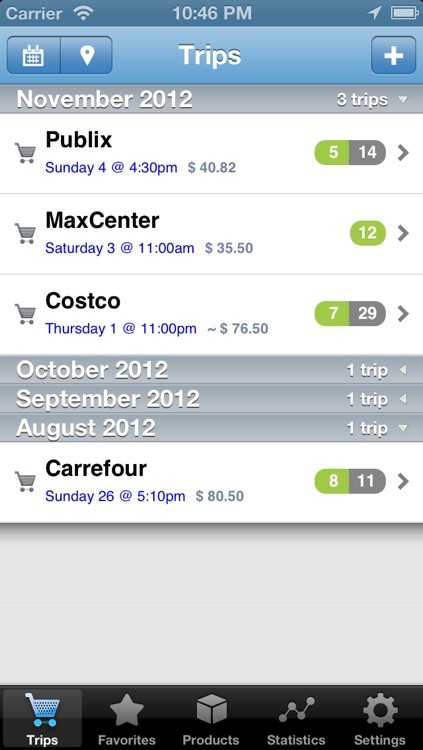 - View your shopping trips in a calendar or map view. - Select items from the preset product catalog (with 220+ products), from previous shopping trips or from your "favorite" lists. 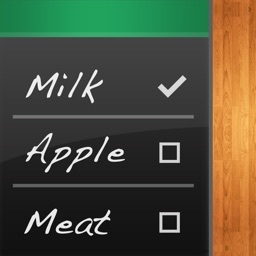 - Use a predictive list to create your next shopping list based on your shopping patterns. - Add/edit/delete products from the preset product catalog. - Add/edit/delete product categories and reorganize the order of appearance to suit your specific needs. 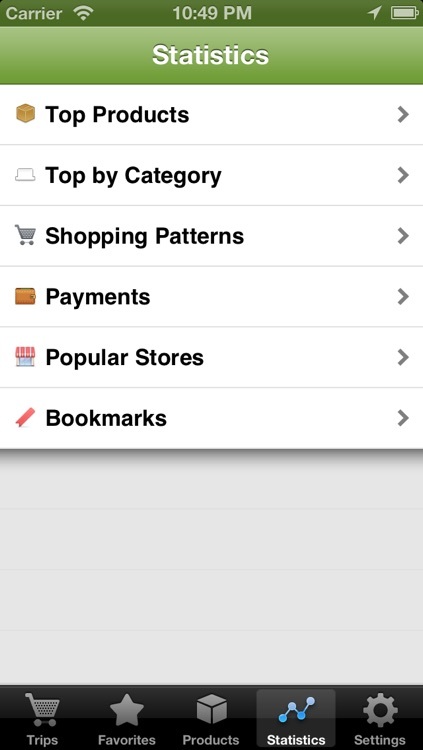 - Sort your product lists alphabetically or by category, and just "shake" your iPhone to change it. - Easily set quantities and prices for each item on your shopping list. 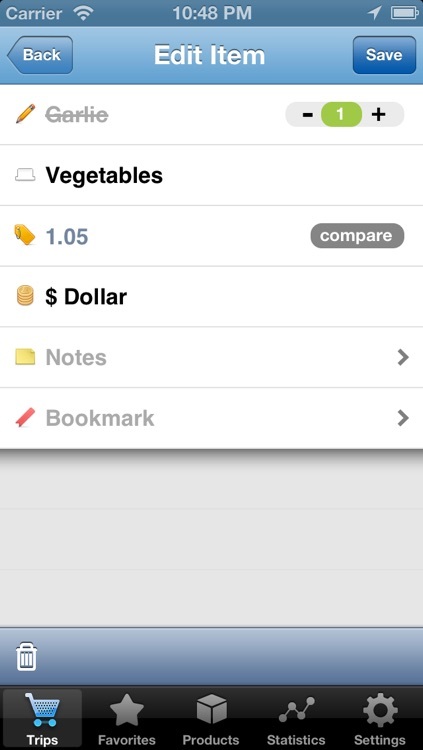 - Compare item prices and let Shopmate automatically price items according to your history. 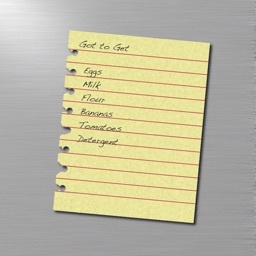 - Set notes and bookmarks for each item. - Keep a record of how much you ended up paying on each shopping trip, specifying cash, credit and coupons on different currencies. 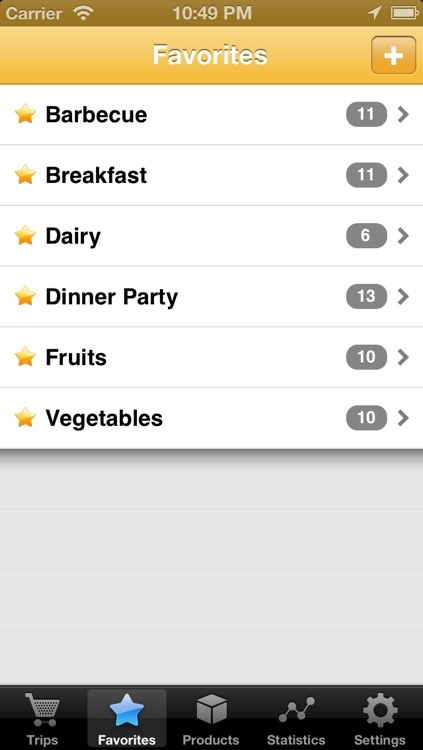 - Count of pending items in shopping list shows as app icon badge. - Add/edit/delete your stores and venues where you’ve shopped. - Share (export/import) your shopping lists by Mail and SMS message (where available). 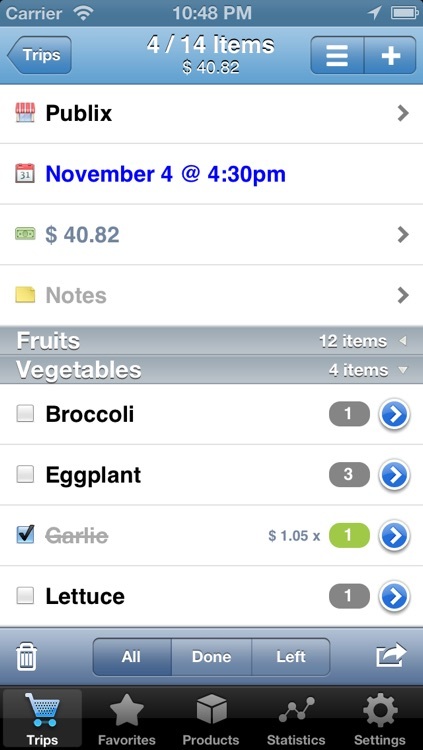 - Manage your favorite product lists like "veggies", "fruits", "weekly groceries", etc. Shopmate comes with six preset favorite lists. - Gather insight about your shopping patterns and statistics. - Multi-language, currently supporting english, french, german, dutch, italian and spanish.